Note that this video was recorded in the days before the Kindle was invented. Note also that I was planning that the novel I am only just finishing 15 more books later was alluded to way back then! Three intertwining life stories told in poetry. Just imagine living your life backwards or knowing how many months you had left to live. Would that change how you lived your life now? This was the book I wrote by accident at 39,000 feet above the Atlantic in a 747. 100 Years of Ermintrude is a book of meditative poetry and my first real foray into the world of publishing. It comprises three intertwining life stories and is told in just 99 stanzas. Although it can be read in less than an hour, it’s something that will stay with you forever and you will want to read again. 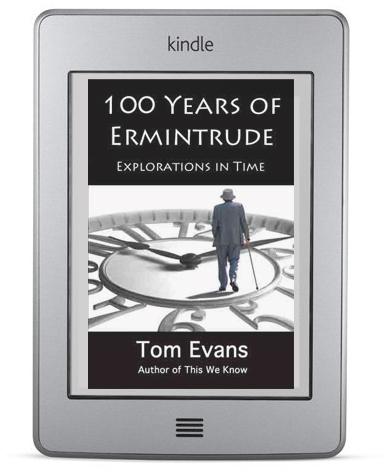 ‘Ermintrude’ started life as a PDF, morphed into an MP3 download and MP4 Jackanory-style video, before I wrote the two sequels and made it as an author in print for the first time. My publisher since went bust, never paid me my royalties and I’ve been so busy on other books I haven’t got round to getting it back in print – it did it’s job, got me writing and launched several new careers for me !!!! It is however now available for the Kindle and Kindle Readers!